Shauna Epeards, probation officer and also supervision unit coordinator. She has worked with Adult Probation for 14 years. 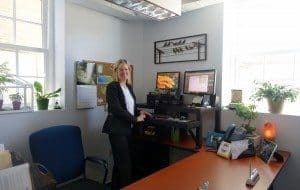 BATAVIA, Ohio – No longer overflowing their offices on the main floor of the Clermont County Common Pleas Courthouse, the Adult Probation staff has a new space to call its own. A project two years in the making, the lower level of the Common Pleas Courthouse in the Village of Batavia has been transformed. With this renovation, which added 8 offices, probation officers now each have their own office to meet with their clients. The quarters, whose many windows offer natural light, also include a waiting room, conference room, and kitchenette. The $400,000 project, which was approved by Clermont County Commissioners in the fall of 2014, was done in two phases: Unoccupied space in part of the lower level was renovated and now houses records from the Common Pleas Court, Clerk of Courts, and Law Library. The second phase involved building the new offices for Adult Probation. The Adult Probation staff oversees approximately 1,300 people on active probation during the year.